We recently celebrated our second wedding anniversary. Like last year, we went out for our anniversary dinner and then enjoyed a special meal the next day. For the next day dinner, I had a challenge. Last year we had a delicious anniversary dinner. And I wanted to make something different this year. After much deliberation, I decided to make fish biryani. Now, I've had some delicious biryanis over the years, but have never made it at home. But I decided to take on the challenge. And I have to tell you that I was so pleased with the result. It was delicious and now that I have done it once, I can't wait to make it again. Dry roast it together and then grind it to a fine powder and then store in an airtight container. Fish: Marinate the fish with the masala and keep it aside for a couple of hours. Shallow fry them and then set it aside. Since the fish will be cooked further, don't fry it crisp. Keep the fish oil for making the fish curry. Garnish: Fry the nuts and raisins, cranberries and keep it aside. Then take about 1/4 of the onions and fry it till it gets brown and crisp. Keep it aside for the garnish. Rice: Soak the rice for 10-15 minutes. Then boil 4-5 cups water with all the masalas and salt. Once the water starts boiling, put in the rice and let it cook for 10-12 minutes. Cook till the rice is half done, not fully cooked. Drain the rice, and set it aside. Keep the water for making the fish curry. Fish curry (masala): Heat the fish oil and saute the ginger, garlic and green chillies. Then add the onions and saute till they start turning brown. Then add the tomatoes and cook till it turns soft. Then add the cilantro leaves, mint leaves, turmeric, chilli powder, yogurt, biryani masala, lemon juice, salt and let it cook for 5-10 minutes till everything mixes together. Add 1/2 or 3/4 cup water kept from rice, if necessary. Add the fish pieces and take it off the heat. 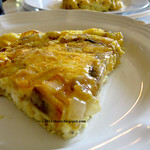 Layering the biryani: Use a deep dish for layering the biryani. Put a layer of rice, and then alternate it with a layer of fish curry. 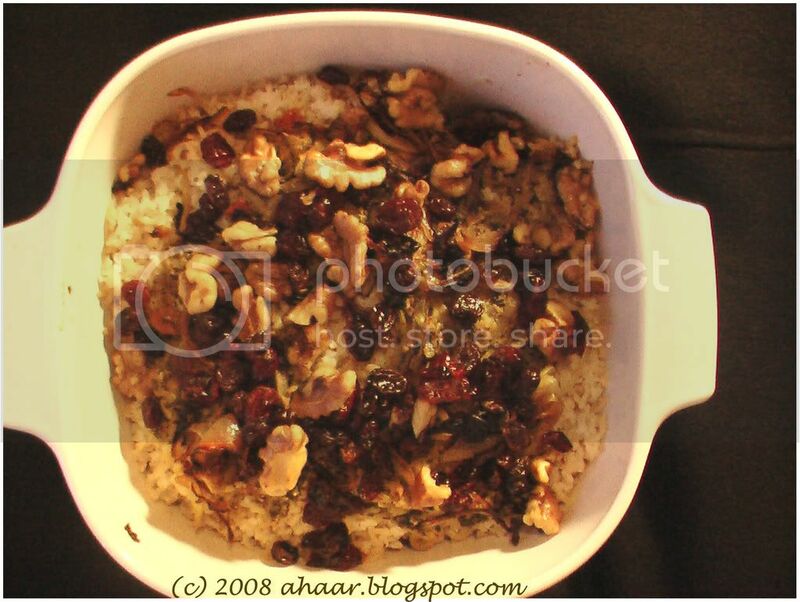 Top it off with rice and then cover it with crisp onions and nuts, raisins and cranberries. Cover it with a lid and cook it in a 250 deg preheated oven for 30-40 minutes till the biryani is done. Serve warm and serve with raita, pickle, or chutney. This special one-dish meal is going to Meeta's Monthly Mingle 18. Thanks for hosting Meeta. This does not feel like the best time to post a soup recipe, after all it was Valentine's Day yesterday. 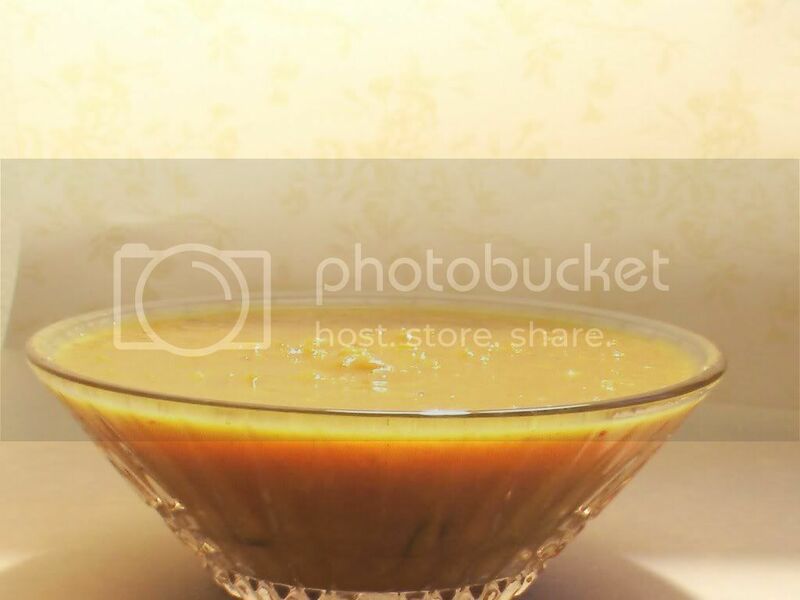 Who will be in a mood for soup after all the chocolates, dessert and delicious dining out. But, the soup can be a cozy dinner starter to cruise into the weekend. For me, the weather has been playing spoil sport. We've had two snow storms in the last couple of weeks and during that time, my hour long commute turns into a two-hour treacherous journey. So I arrive home tired and frazzled. And the soup works perfectly, it warms and calms me. And with butternut squash, acorn and corn, it is hearty and filling too. I have made several versions of this soup, without cream, with cream, without lime zest, with lime juice and it works every time. So feel free to make it your own with your special touch. I always make a bigger batch of the soup and keep some in the freezer for the snowy days! Cut the butternut squash, acorn, and corn and our 1 tbspoon olive oil, salt and pepper. Preheat the oven to 400 deg F and roast the squash, acorn and corn for an hour. Once it's cooked the squash and acorn will peel easily. 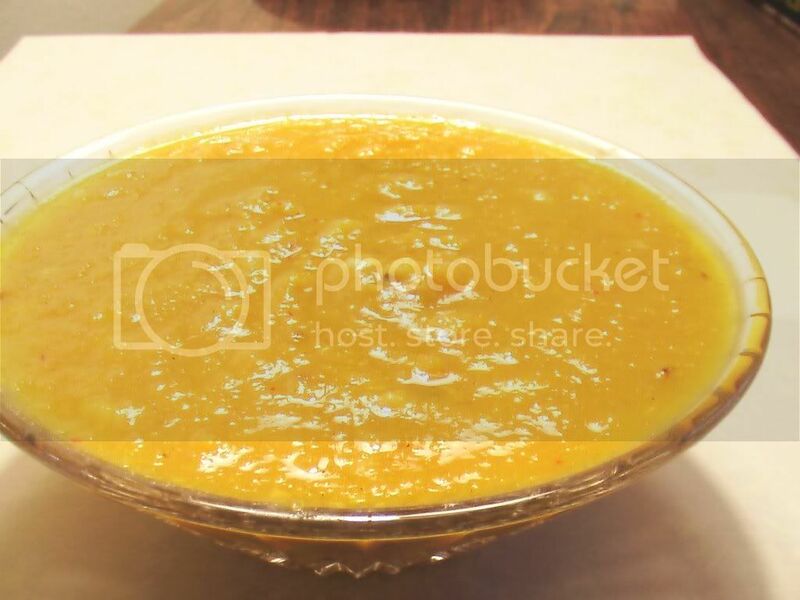 Puree the squash, acorn and corn in a blender using the vegetable or chicken broth. I make it like a thick paste. Set it aside. In the meantime, cook the wild rice separately. I make it in the microwave while the squash is in the oven. Then in a thick bottomed pot, heat the rest of the oil and then temper it with the red chilli. Add the ginger and onions and saute for 1-2 minutes. Add the squash puree, the rest of the broth, water and cook on low to low-medium heat till it all mixes together. Then add the cumin powder, salt and pepper to taste along with the rice. Then add the lime zest and cook on closed lid for 4-5 minutes till it all mixes well together. Take it off the heat and then add the cream. Mix it well. Take the chilli out before you start serving the soup. This goes to No Croutons Required hosted by Lisa's Kitchen and Tinned Tomatoes. 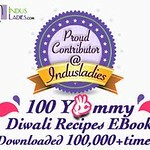 On another note, I have been meaning to say thanks for a long time to Sandeepa of Bong Mom's Cookbook for the bori, panch phoron and recipe cards she sent me last year. And to Kanchana of Married to a Desi for the delicious cranberry thokku, fresh peaches, injimanga and fresh turmeric when we met for lunch at Chennai Vilas. Thank you for the delicious treats. They were enjoyed over several meals! 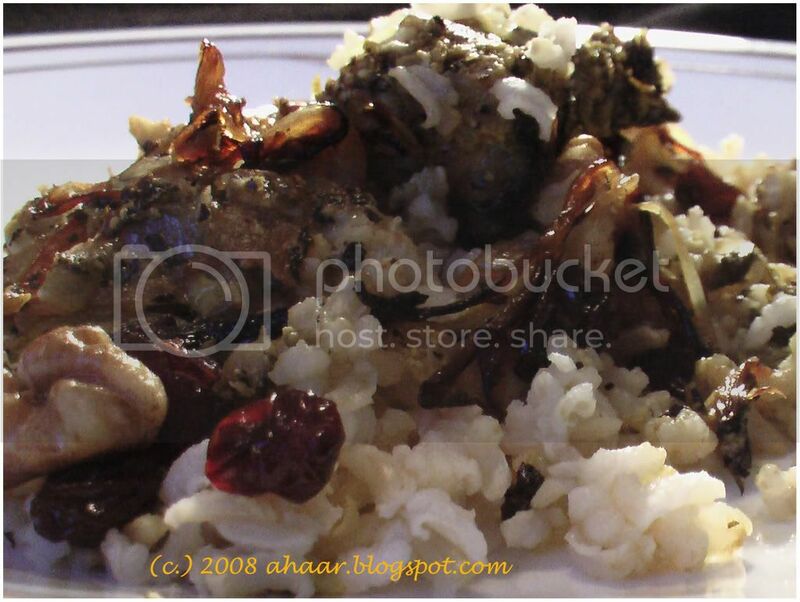 If you had been invited to an Indian banquet 2,000 years ago, what would you have found on the menu? 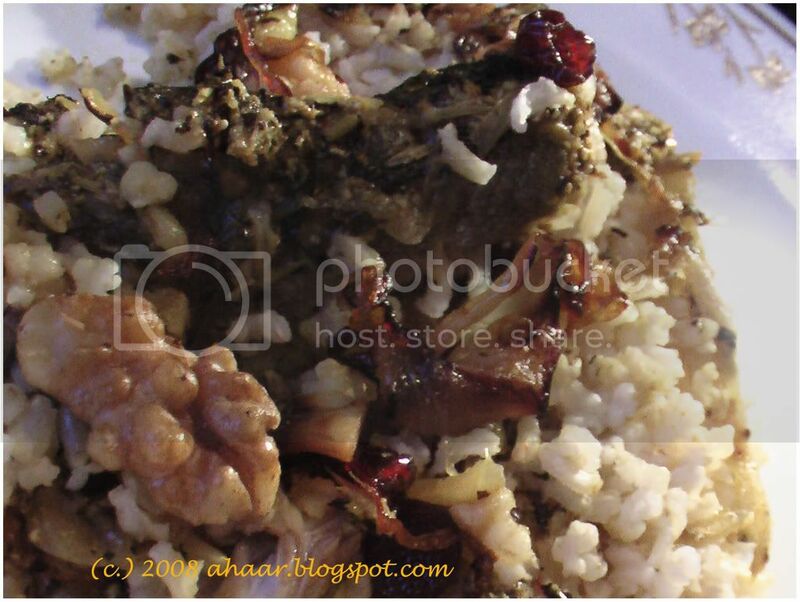 Rice, accompanied by chickpeas (chana) or kidney beans (rajma). 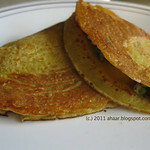 Lentils (urad, moong, masoor), either boiled, made into a batter and deep-fried (vade), or rolled into thin papads. A variety of vegetables, including squash, bitter gourds (karela), peas, sweet potatoes and lotus stems. The food would have been well spiced, using generous amounts of turmeric, cumin, asafetida (hing), pepper, mustard seeds and fenugreek. Coriander, lemon and ginger would have been used for added flavour, but garlic and onion would have been frowned upon. The food would have been cooked in sesame or mustard oil — or, on special occasions, ghee — even though the great physicians of the time, Charaka and Sushrutha, warned against eating too much fried food. People with a sweet tooth would be satisfied with apupa (barley or rice cakes deep-fried and dipped in honey), kheer from rice cooked in milk, and mandaka (parathas stuffed with sweetened lentil paste). A variety of meats were offered, including chicken, goat and venison — but the taboo against eating beef was already established, and vegetarianism was becoming widespread. A modern guest at this ancient feast would have been equally struck by what was missing, as many of the ingredients indispensable in Indian food today would have been absent. Potatoes and tomatoes were still unknown in India, as were chilies — the only heat in the spicing came from black pepper and mustard seeds. There were no nuts or cream. For Congress peanuts, Communist peanuts, Computer kodbole, and much more, check out Subbamma stores in Gandhi Bazaar! This wonderful little video by Kamla Bhatt brought back fond memories of one of my favorite parts of Bangalore - Gandhi Bazaar. And if you're there, don't miss Vidyarthi Bhavan's dosais in the afternoon! I like snacking between meals. And feels like I do it more regularly during the wintertime. When the energy level dips, I automatically reach out for that snack. 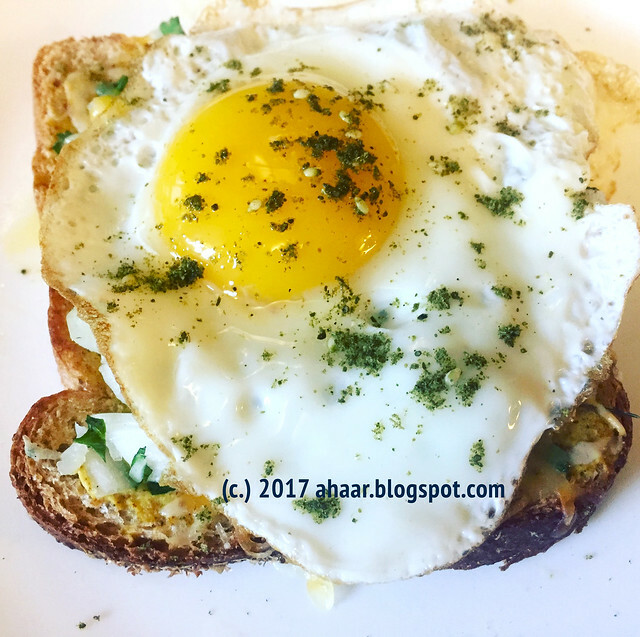 For some time now, I have been trying to make winter snacking healthy, some works, others don't. But this delicious fruit yogurt has been our snack for the last few weeks. We've thought of making this flavored yogurt for a while now, and actually tried it for the new year menu. 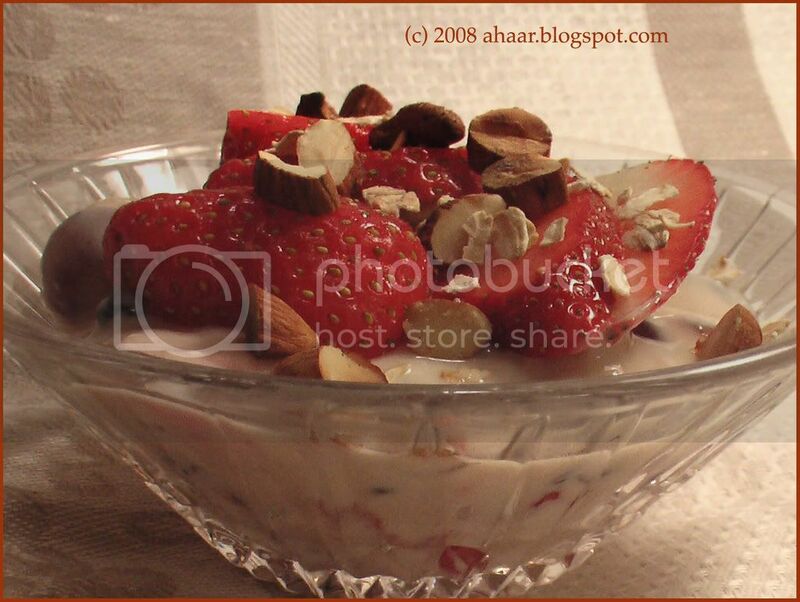 We have varied the fruits in the yogurt every time and are yet to complain about the taste. It's not overly sweet, but each bite is flavorful with the fruits, honey, orange zest and vanilla flavor. 1/2 cup chopped nuts - I use a mix of almonds, walnuts and pecan. This is the easy part. Clean and chop all the fruits. 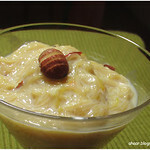 Mix honey, vanilla essence and orange zest in the yogurt till it mixes well. Then add all the fruits, nuts and dried fruits. 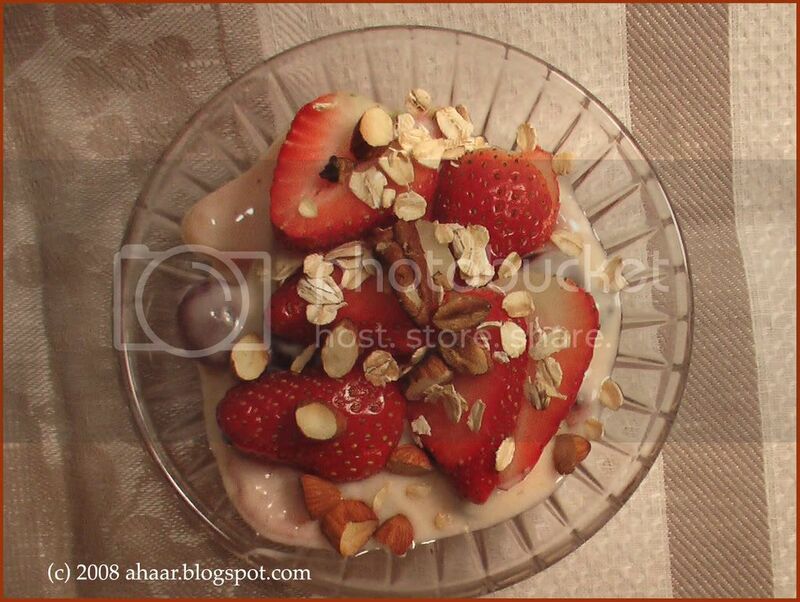 Reserve some nuts, strawberries, and oats for topping. 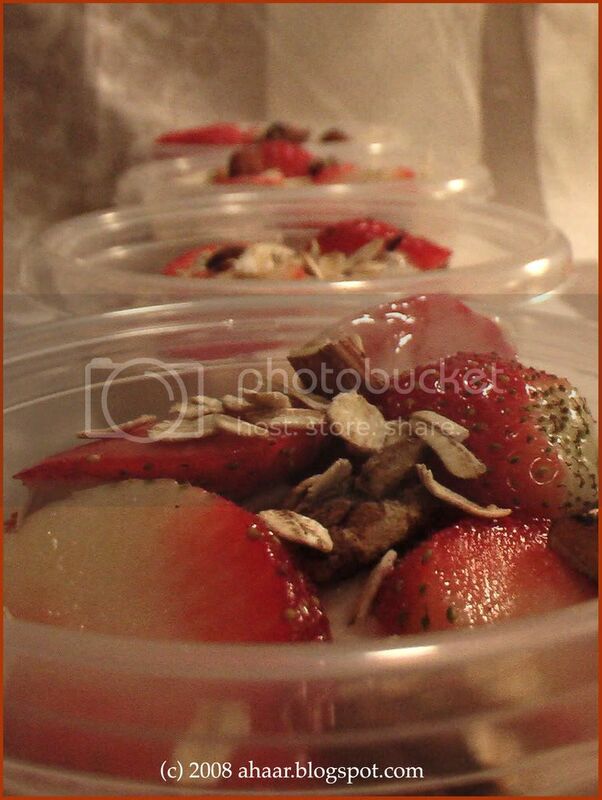 You can then divide the portions for the week and top it with nuts, oats and fresh fruits. Here are our snack dabbas (boxes) for the week.